One year ago today, at 6:07AM, Daniel was born gently at home in the water. He was born a few feet from where he now sleeps at night, in the space that we've just recently started calling "Daniel's room." Words completely fail me when I try to describe this first year of parenthood. It has seemed to pass by very fast...and also agonizingly slow at times. It's been extremely joyful while also being the most difficult thing I've ever done in my life. The best I can do is to say: It's been incredible. It's been awesome. And I'm glad I can say that I've truly soaked in every moment. In any case, in celebration of this special day, I'd love for you to share your thoughts on birth, your birth stories, your favorite birthday-celebration ritual, what kind of cake you'd choose to take to a deserted island, or anything (tangentially related) that comes to mind. I can't wait to read what you have to say! Happy birthday, Daniel! 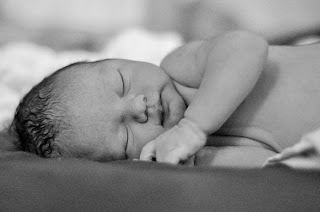 That photo of newborn him just melts my heart. We have no particular birthday traditions around here, but we did celebrate the Critter's first birthday in the park, and it was a marvelous marvelous afternoon of family, good friends, and perfect September weather. Happy Birthday to your Daniel! We have only celebrated one birthday as a family of three, so our traditions aren't yet fully developed. Like you I did spend a great deal of time considering our girl's arrival and the events that led up it. Congratulations! This is YOUR mom-day as well as his birthday ... you are lucky to have good memories to look back on.